Air Fryer Frozen French Fries. Learn how to effortlessly cook frozen McCains French Fries in the air fryer and if it is possible to cook McCains Quick Cook Crispy French Fries in just 12 minutes. Today I would like to share with you how to cook Air Fryer Frozen French Fries and how quick and simple it is. I love French Fries. McDonalds is my favourite. I love the salt that they put on them and I love now thin and crispy they are. I used to always have them growing up with some sweet and sour sauce and they tasted oh so good. I am aware as a 30 something, that they are not the best thing we can eat and that in between making your own and having a McDonalds, is the idea that you buy a bag of McCains Quick Cook Crispy French Fries and have fries that taste as good as McDonalds via the Air Fryer. One of the worst things to be fed from the freezer must be McCains oven chips, which is exactly what McCains Quick Cook Crispy French Fries are. Back in the 1990s they were always disgusting. Not just McCains but every frozen food chips brand that oven cooked the chips. They were soggy, had no crisp and just tasted weird. Your mum would cook them with some beans and you always dreaded it. Or like my Dad did, sneak off to the chip shop when my mum wasn’t looking! But it was because French fries just taste horrible unless they have been fried. We shouldn’t microwave them, we should fry them and that is why the air fryer is a genius if you want to eat frozen French fries, but you don’t want them to be tasteless in the oven. We bought a pack of McCains Quick Cook Crispy French Fries that cook in the oven in 5 minutes, thinking that they would be a great option to transform into delicious quick cook air fryer frozen French fries. I am using McCains Frozen French Fries as an example, but you could use any brand of French Fries. It is just that McCains is one of those brands that is known around the world and many of you will relate to it from childhood. I remember McCains because at the end of the 90’s I worked in one their factories. I was 17 and had a gap of a couple of months between college placements. It was the perfect time to earn some easy money. I worked on their jacket potatoes and it was fascinating to see the process that goes into the frozen food. The wonderful thing about using thin French Fries in the air fryer, (compared to using thick steak chips), is that they don’t care if they are over crowded. You can fill the air fryer to its limit and they will still all cook perfectly. None will be over cooked, none will be under cooked and you can just serve them up with burgers, hot dogs or whatever your family is having for dinner. How Do I Cook Frozen Fries In My Air Fryer? To cook Frozen fries in the air fryer you start off with a preheat and then you add as many French Fries as you like (until the air fryer is full) and then cook for 12 minutes. You don’t need to add any extra oil or do anything else as your French Fries will already be prepared. When your frozen fries are cooked in the air fryer, if you want that McDonalds wow factor, then you want to shake them in sea salt. That gives them a much nicer taste and when I have them like this, I really think I am having French Fries at McDonalds, not that I have given a new lease of life to McCains oven chips. Because McCains Frozen French Fries have been prepared already with 9% sunflower oil, you don’t need to add any extra olive oil to the air fryer. But if you’re using a different brand just read the ingredients on the bag to double check. The Philips Air Fryer – I used the Philips XL air fryer to make my air fryer frozen French fries. This is because it can take a big portion and they still all cook evenly. I cooked 750g of McCains Quick Cook Crispy French Fries. 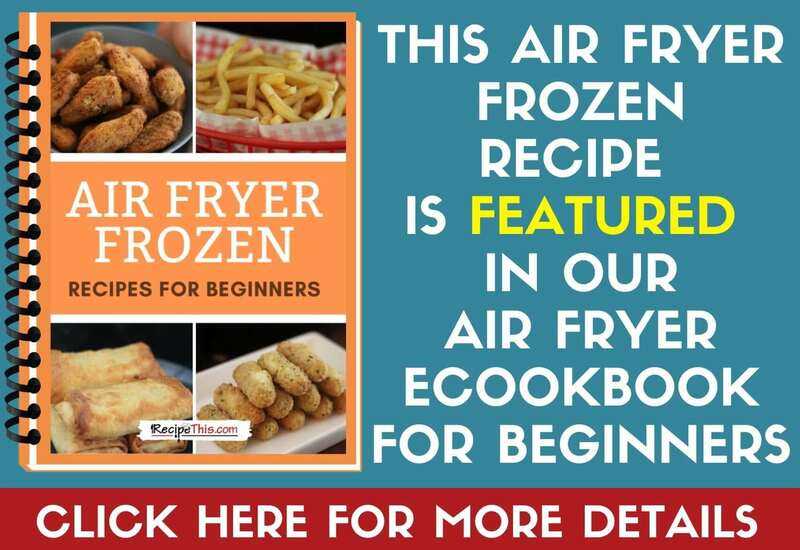 How To Cook Frozen Food In The Air Fryer – This post started off as a quick post showing you how to cook a few different things in the air fryer from frozen and has grown and grown. Preheat the air fryer at 180c/360f. Place the frozen fries inside of the air fryer and cook for 5 minutes at 180c/360f. Serve with sea salt and your favourite sauce. Cooking with frozen fries is easy. They have already been prepared for you so you don’t need to add oil or shake the fries during the cooking process. The maximum that you can cook at once in the Philips XL is 750g of Frozen French Fries. Remember to adjust this depending on the size of your air fryer.